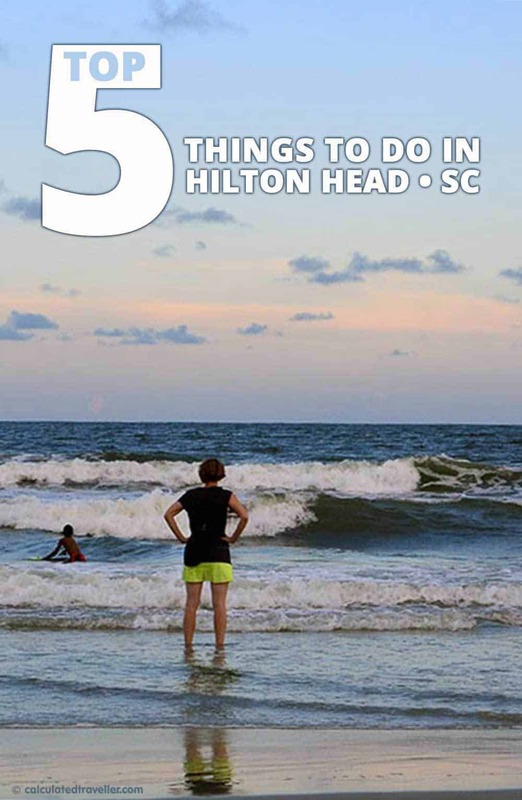 For one of the very first times, we pre-planned very little of our one week vacation to Hilton Head Island in South Carolina. I have to admit, I was pleasantly surprised — and must have anticipated the low-key, relaxed vacation I was about to have. 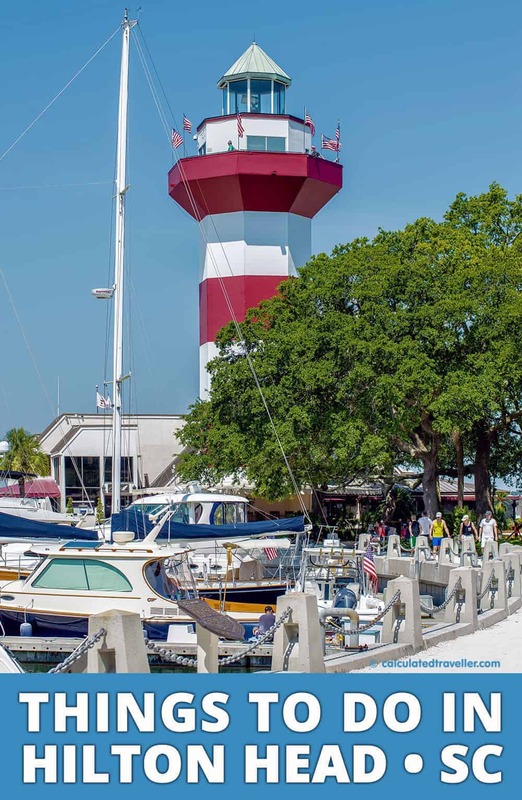 I’ve compiled my top 5 things to do in Hilton Head South Carolina, counting down from #5 to my #1, top choice. Hilton Head, who takes its name from a headland near the entrance to Port Royal Sound, is home to a vast array wildlife. We saw lots of wildlife throughout the island and on the tidal marshes including a variety of birds such as egrets and Anhingas, standing with their dark wings stretched out in the sun, logger sea turtles, and bottlenose dolphins. We even saw lots of fish jumping out of the water while swimming in the ocean. If you really want to see dolphins up close, there are numerous excursions available where you can paddle or swim with dolphins in Hilton Head! Check prices of dolphin tours on Viator. Although on this trip, we didn’t see alligators up close, we were warned, when riding our bikes on the trails, to keep an eye out for them and to use extra caution. Now, that’s a bike ride! Disappointed that I didn’t see alligators up close? 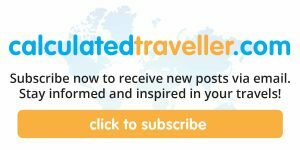 Click here for a trip that I went on that had enough to make up for it! One of my favourite parts of Hilton Head was the people. Admittedly, at the beginning of the trip, we felt a bit frustrated; we were used to the fast-paced, quick responses of urbanites from Toronto. You won’t experience this in Hilton Head. Instead, the people we met were laid back, and will give you the service you need, in due island time. The only exception was at Skull Creek Boathouse. The food there was not only very tasty, but the service was very fast and efficient. Nonetheless, there is something to be said for taking your time. Although I’m not sure I can ever 100% adapt that philosophy Monday to Friday, it is undeniably beneficial when you are on vacation. Ahh. I’m pretty sure that #4 influenced my #3 pick. Normally, I do not have a sweet tooth. And, before this trip, I would have never guessed that chocolate would be anywhere on my top 5. But, I was pleasantly and sweetly (sorry, bad, bad joke), surprised. However, I usually can’t resist two other things, when my daughter wants something and when something is FREE! So, when we heard that The Chocolate Canopy (a local candy store) was offering free chocolate tours, I was sold. I have to say, walking out of the tour, chocolate covered pretzel, covered in nuts, in hand — that I proudly hand-dipped and rolled in nuts all by myself, I might add – I was not disappointed. Although this is not a large store by any stretch of the imagination, I urge anyone visiting the area to stop in and listen to the owner talk about the quality of chocolate they use and the meticulous process they follow. The passion that he exudes during his talk, really makes you think about the quality of the ‘bigger’ brand chocolates that we eat. Although I have been on many, many tours through Hershey’s Chocolate World and LOVE the free samples they give out after the tours—and will always be a huge fan, I must admit if given the choice between a Hershey’s bar and a chocolate from The Chocolate Canopy, Chocolate Canopy wins, chocolate-covered fingers and hands down. Yum. The Chocolate Canopy is owned by a husband and wife team and has been family owned since 1982. Pictured here, you see one of their best-sellers: chocolate sand dollars. As most of you that read my posts are aware, I love an active lifestyle. So, Hilton Head Island was not a disappointment at all. As you drive onto the island, you start to see lots of people riding bikes or jogging on paths that align most of the roads. On our trip, we rented bikes, and I have to say, there is an amazing, freeing feeling that comes along with jumping on your bike and peddling your way to the beach. Almost around every corner too, you too, see numerous golf shops and courses, so the golfing enthusiast will not be disappointed. One of the most exciting things we did as well, was parasailing. 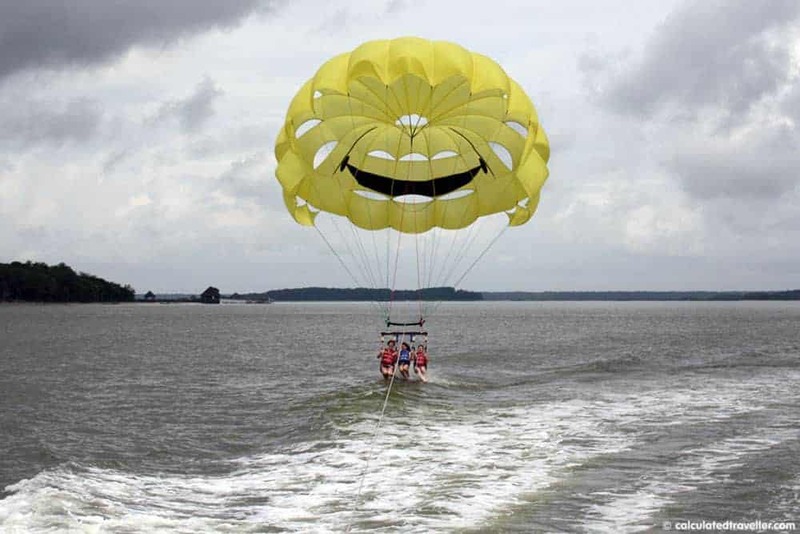 For more on this, read about my article Parasailing in Hilton Head. Hey, shopping is a sport, in my mind! One of my favourite places to shop–right after Piggly Wiggly–was the South Beach Marina. We decided to visit on a Tuesday night as the firework display is well-known to the area—and one particular boating company offered a 2 ½ sunset tour, which included a view of the fireworks at 9:00 p.m.
Before we set sail, we walked around the shops of the South Beach Marina, enjoyed watching kids doing a hula hooping contest in the courtyard, along with their native parrots, then gorged on crab and oysters at the Salty Dog Cafe. We then walked over the Gypsy Dolphin Watch boat for a ride through Calibogue Sound, past Harbour Town to Broad Creek. As the boat departed from the dock, we saw a few dolphins swimming by the boat. We then watched the beautiful scenery float by us, and eventually, at 9:00 p.m., we saw a fireworks display while relaxing on the deck of the Gypsy. If you are considering this tour, I do recommend asking the captain where to sit before departure as it is un-narrated and we had to manoeuvre around the boat to get a decent view of the fireworks. Make sure as well, to pack the same laid-back attitude that I found above, as the ride back after the fireworks can feel a bit long and tiring, but is recommended for the traveller looking for a low-key, relaxed ride across the water. We enjoyed Coligny Beach Park because of the beautifully done walkway leading to the beach, although Driessen Beach Park offers a quieter beach, with a wooden path serving as an entrance to this beach. I also suggest taking a quick surfing lesson, then just enjoying the day by renting a board, then either by riding the waves, or sleeping under an umbrella, just enjoying all the beauty that Hilton Head has to offer. 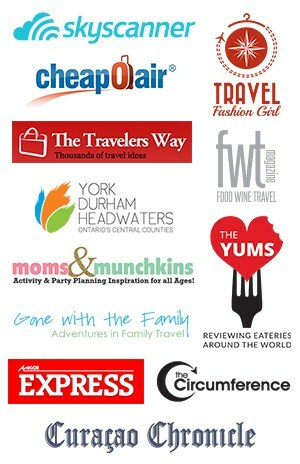 Check out Hilton Head Island on TripAdvisor. I visited Hilton Head when I was 17 and loved it. It was so completely laid back and relaxing. Like Anita, I got distracted by the chocolate. Once I satisfied the craving with something from my own chocolate stash, I enjoyed reading the rest. Great post! Anita and Karen, Agreed that chocolate is a great distraction! Yum! Thanks for your comments! Sorry, but I got distracted by the chocolate, activities and beaches….aces for me! Brandon, it is definitely worth the trip! Chocolate, beaches and no hustle and bustle….can’t wait to go back to HHI. Angela, Agreed! 3 great things!